I was recently contacted by Chris Donahue at Krrb Blog and asked to talk about my collection of Zeppelin bootlegs and The Year of Led Zeppelin project. You can read the interview HERE (or HERE)! Wow great interview!!!! I have eery zep concert bootleg known as well!!! And youre right about the internet and bit torrent!! that is the only reason i have everything i have!!!!! Yeah its about 260 and other odd concerts too!. great interview tho! And i realy appreciate all of the reviews because every time i feel i need to know about a concert before i listen to it, i come here! Actually when i was collection and finishing up the collection, I used this site as a reference so i knew i had every single concert!!! And mine match up with every single date you posted! So thank you friend and fellow Zep Head!!!!! My name is Hunter Schick-Albanese, this is my zep page i am commenting from, Here is my youtube page Long Live Led Zeppelin where i upload all zep concerts https://www.youtube.com/channel/UCM1b9ETPb33izVhIB52-E-g, and also my facebook page www.facebook.com/ledzep1987, please check it out!!!!! I was raised on classic rock radio, sitting in the back seat of my Dad's old Chevy Nova, so Zeppelin has been a part of my life for longer than I can remember. I used to sneak into his record collection when no one was home and pull out the Zeppelin records so I could make cassette copies with my little Fisher-Price turntable. I can't say for sure what drew me to Zeppelin in particular. Something about the mythology that seemed to surround the band sparked an interest in my adolescent mind. Zeppelin was a relic of the past, their music echoing through time and out of my stereo, shrouded in mystery. Why did you start collecting Zeppelin Bootlegs? I had been picking up various albums and box sets over the years, so I was familiar with the majority of their studio output. I also had an old VHS copy of The Song Remains the Same that I watched repeatedly on a little TV I had in my bedroom. Then in '97, The BBC Sessions was released. That set really piqued my interest in live Zeppelin. The following summer, my Dad and I went on a road trip to Cleveland to see Jimmy Page and Robert Plant on tour. The afternoon before the show, there was a Zeppelin collector's convention called Zepfest at a club nearby. The tables set up inside the club mostly dealt in official memorabilia (records, posters, t-shirts, magazines, books, etc. ), but I remember a dude sitting on the sidewalk outside with a duffel bag full of bootleg CDs. They were all too pricey for 16-year-old me, but just knowing that stuff existed opened up a whole new world. I bought a book that day called Led Zeppelin Live: An Illustrated Exploration of Underground Tapes by Luis Rey. Inside were reviews and information about every known live Zeppelin recording available at the time. I read that book cover to cover, dreaming of getting my hands on these tapes and experiencing first hand the revelatory performances they held within. Back then, it wasn't quite as easy to acquire live recordings as it is now. The internet was still in its infancy, as far as music trading was concerned. There were websites and message boards and mailing lists where people could find other collectors to trade with, but the majority of those trades were still carried out by sending cassettes through the mail. My earliest bootleg acquisitions came through people who were selling off CDs they no longer wanted and generous collectors who would send you a tape dub if you sent them a blank cassette and return postage. But once I started down that path, I was hooked. To discover a seemingly endless supply of music from my favorite band that I had never heard before was absolutely amazing. As time went by and technology advanced, it became much easier to get your hands on as many of those recordings as you wanted. To the point where I now have a copy of every known Zeppelin recording in circulation. Do you have a favorite Zeppelin Bootleg from your collection? If we're talking actual physical releases (LPs, CDs, cassettes), I'm pretty fond of my copy of the Destroyer box set from 4/27/77 in Cleveland. It's a legendary show and one of the earliest Zeppelin bootlegs made from a soundboard recording. I don't have the early pressing which came in a hard plastic carrying case, but it's a nice set nonetheless. What’s the most rare Zeppelin Bootleg from your collection? I'm not sure any of them are particularly rare. Back when I was buying vinyl and CDs, I never had the money for the really sought-after stuff from labels like Empress Valley, Tarantura, Trade Mark of Quality, etc. My goal was always to get as many shows as I could for the money I had to spend, rather than the most elaborately packaged releases. And everything kind of went out the window when bit torrent came along and made it easy for anyone to share their collection online, including low-generation copies of the master tapes that usually blow the old bootleg pressings out of the water in terms of sound quality. I enjoy having the handful of physical releases I own from a nostalgia standpoint, but they're certainly not the first thing I reach for when I want to listen to the best possible version of a particular recording. What do you look for when adding Zeppelin Bootlegs to your collection? At this point, it would have to be a significant upgrade to a recording I already have or a previously unavailable show that's being released for the first time. There aren't many opportunities to add to your collection when you already have everything. What’s the most unique way you acquired a Zeppelin Bootleg? Back in the late '90s, eBay was incredibly strict when it came to selling bootlegs. It was virtually impossible to find an auction that included any kind of Zeppelin bootleg. However, while browsing through auctions for bulk vinyl collections one day, I happened to find someone who was selling a box of 50-75 assorted classic rock records. Initially, I was just looking to flesh out my burgeoning record collection, but then I noticed there were a handful of Zeppelin bootlegs in the box. I think I ended up paying about $100 for the box and that's where the majority of my Zeppelin bootleg vinyl collection came from. Just a lucky coincidence on eBay. Where do you store or display your collection? The vinyl is filed away in two big LP Bins with the rest of my record collection. The CDs were packed away and put in storage last year while my wife and I were rearranging our apartment in anticipation of our son's arrival. How did The Year of Led Zeppelin come about? When bit torrent came along and made it easy to download as many live recordings as you wanted, I started stockpiling Zeppelin recordings and just storing them away on external hard drives in hopes that I would eventually get around to listening to them. However, it became apparent that unless I really dedicated myself to it, I would probably never find the time. I was discussing this with a friend of mine one night over a few beers and joked "wouldn't it be funny if I listened to every Led Zeppelin recording in order next year?" It was an interesting idea and the more I thought about it, the more I felt like it was my one chance to actually get around to listening to all of this stuff I had been collecting over the years. I didn't originally set out with the intent of becoming an authority on live Led Zeppelin recordings or anything. I just thought it would be cool to write about the shows I was listening to, so I would have a resource I could go back to in the future to help me remember which ones were worth revisiting. The website just seemed like the easiest way to achieve that, since it would act as a searchable database of my notes. I really enjoyed it! It helped me form a greater understanding of how the band interacted and evolved in a live setting over time. It also gave me a new appreciation for the studio albums since I abstained from listening to each of them until I reached the point of their release in the live chronology. By sticking to such a strict schedule and listening to everything in order, I felt like I was on tour with the band, following them through their career and the changes they went through as the years passed. I'm really glad I did it and saw it through to the end (despite how much I wanted to quit while slogging through the seemingly endless '77 American tour). It was the perfect culmination of years of collecting, reading about and obsessing over this band and their music. And it's turned out to be a really valuable resource to other collectors! I've had almost 78,000 unique visitors to the site from 156 different countries. It's been 7 years since I started the project and I still get emails and comments on a weekly basis from people who are using the site as a guide while building their own collection. It's incredibly humbling to know that so many people are interested in this little project that started out as a joke between two friends. 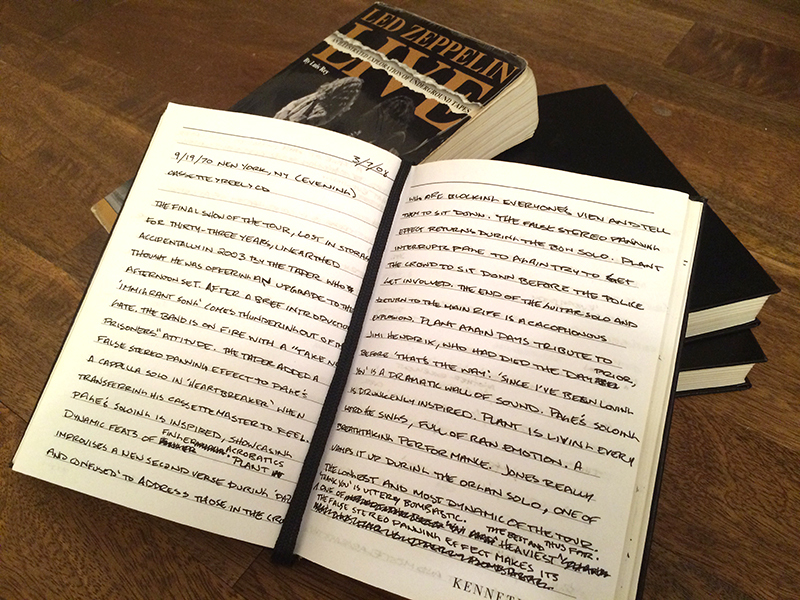 I never thought as I was scribbling notes into my little black book on the subway that my words would have such a far-reaching effect on other fans in the Zeppelin collecting community. It all goes back to the moment I bought that book in Cleveland 17 years ago. I feel like my project was the next logical step to build upon the groundwork laid by Luis Rey and his collection of reviews. It just took someone crazy enough to actually do it. What was your favorite recording you listened to? There are many incredible performances spread out over the band's entire career. I made a point of tagging the reviews of those I felt were particularly special as 'Must Hear'. But when someone asks for my favorite, I always say the evening show at Madison Square Garden on 9/19/70. It's a monster of a performance. The final show of the tour in one of the band's favorite cities, they leave everything they have on that stage. Jimi Hendrix passed away the day before and it's as if this reminded them that it could all disappear in an instant, inspiring them to give the crowd an experience they would never forget. It also happens to be the only time my Dad saw Zeppelin in concert, but that doesn't weigh much into my opinion. It truly is one of the best shows they ever played. The amazing thing about it is the tape was lost in storage for nearly 33 years, finally surfacing in 2003. Are you sick of Led Zeppelin yet? I'll be honest, I took a long break after I finished the project. Even now, closing in on a decade removed, I still don't sit down and listen to an entire show very often. I'll put a recording on in the background while I work or play with my son sometimes, or listen to a few songs from a specific date that I've been thinking about. But my musical tastes and interests are very wide and there are only so many hours in the day. The only reason I visit this blog is to read this well-researched and properly composed report. Such publications say that they are chosen by a large number of people because they have a very valuable value in the general sense.